Use Klein Tools LAN Scout Jr. Tester to test continuity on twisted pair data wiring connections. It has an integrated tone generator that supports multiple tones and control of the pins carrying the tone. It also has a self-storing remote that makes this tool easy to store and locate. This Multi-Purpose tool performs 6 different functions with the same tool. It gauges, cuts and strips wire, measures and shears machine screws and crimps insulated terminals and connectors. Use the threaded holes to easily measure the size of a machine screw and cut it if needed. The plastic-covered handles are cushioned for added comfort. 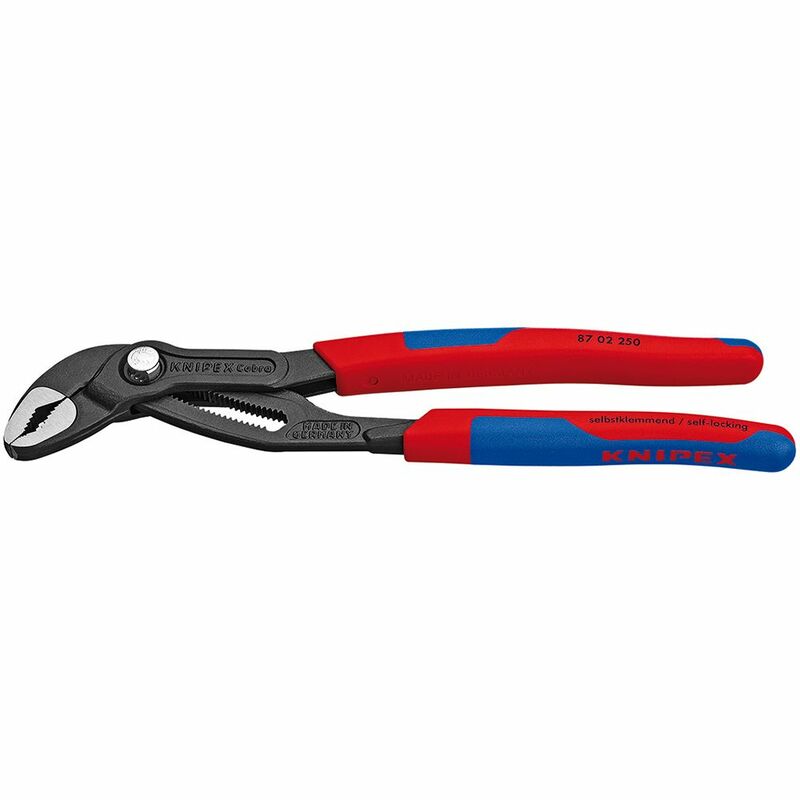 10 Inch Cobra Pliers-Comfort Grip Knipex Tools is the worlds largest manufacturer of professional pliers since 1882. Knipex Pliers, Cutters, Insulated Tools and other products have been the tools of choice for Professional Tradesmen and end users who are serious about their hand tools and demand industrial quality. Knipex Tools are made from start to finish utilizing the highest quality materials. Based in Germany, KNIPEX Tools are German engineered to produce a tool unmatched in the industry in terms of features, comfort, design and performance. 10 Inch Cobra Pliers-Comfort Grip is rated 4.6 out of 5 by 7. Rated 5 out of 5 by CL792 from Great quality tool! A must have!! Great quality tool! A must have!! Rated 5 out of 5 by Robert from best pliers ever. ... best pliers ever. Rated 2 out of 5 by Bob from Not exceptional anymore I have mechanical engineering education and I owned several Knipex pliers including an older cobra pair which were great. The new ones are the sloppiest fit pliers I have ever seen. I would expect this kind of sloppy fit for disposable $4.99 made in China and bought at a dollar store tool. I would never expect this from Knipex. Moreover, the multi-compound grips are non-slip but without the expected bulges. I paid more for the better grips but got what look like and feel like a knock off design. The steel is obviously on par with the older ones but the very loose fit box-joint and redesigned grips make them feel cheap.